One of my favorite foods is winter squash. There are so many scrumptious varieties and I have enjoyed all that I have tried. My favorite winter squash is Kabocha squash. It’s that plump looking green one that reminds you a little bit of a pumpkin but it’s, well – green on the outside. Winter squash is a wonderful source of starch, vitamins and fiber. Plus it’s pretty tasty which is what we all love about it. Pick up a few types of winter squash and see which ones you like the best. I bet you’ll have fun trying them. 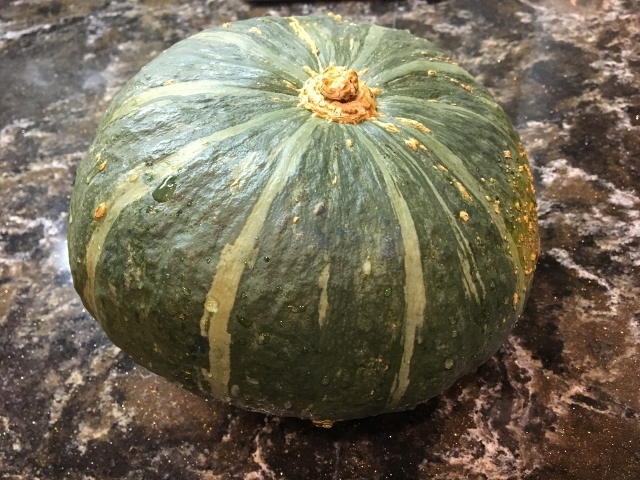 The outside of this Japanese variety of winter squash gets so soft when cooked that you can even eat the skin. I love that because if I don’t have to peel the squash that is lot less work. Before cutting and cooking the squash I give it the spa treatment in the kitchen sink with a little vegetable wash and a nice scrubbing with a vegetable brush. Rinse and it’s ready for step two. 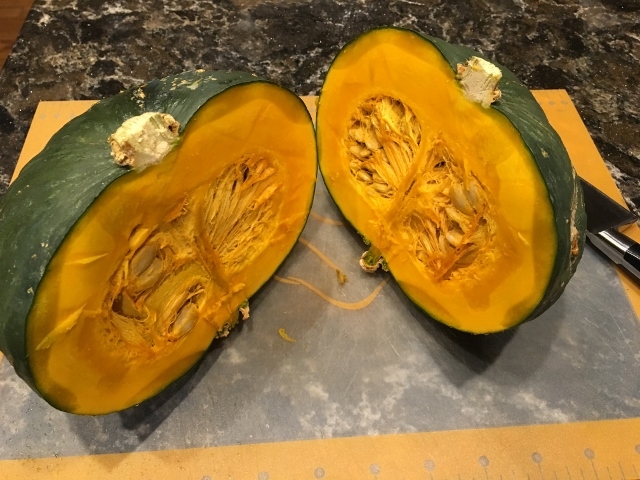 Winter squash has a very hard outer skin that makes it a challenge to cut into. 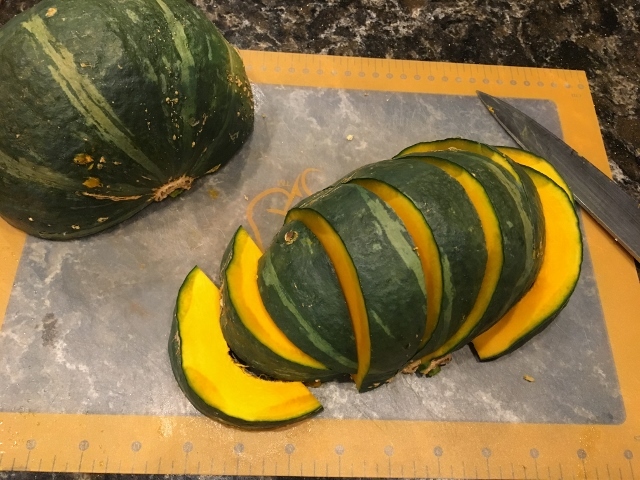 Using a paring knife cut some slits into the skin of the squash – 6-8 times is good enough. Then place the squash in the microwave oven for 4-5 minutes on high for about a 4-5 pounds squash. If it is a bigger squash give it another minute. I like to put a layer of paper towels under it. The microwave softens the squash enough to make cutting into it easier but does not cook the squash. 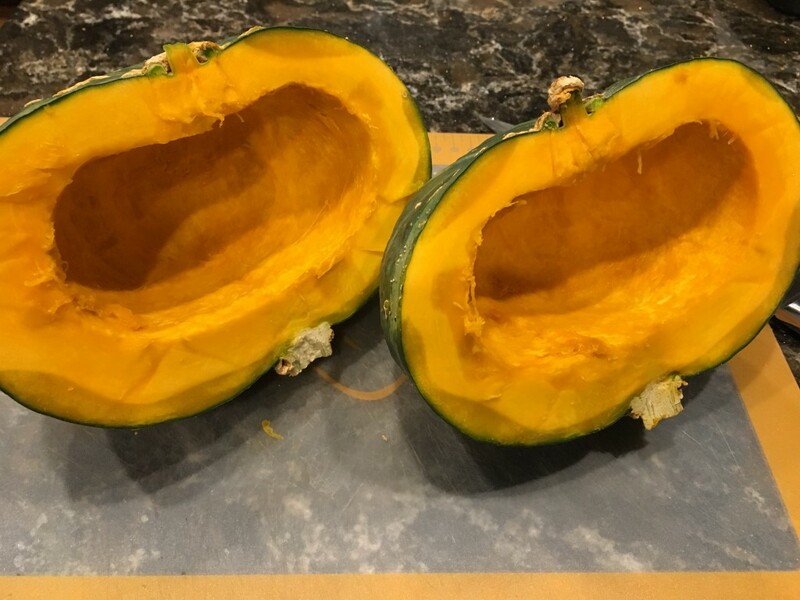 I use this technique for all winter squash – easy peasy! 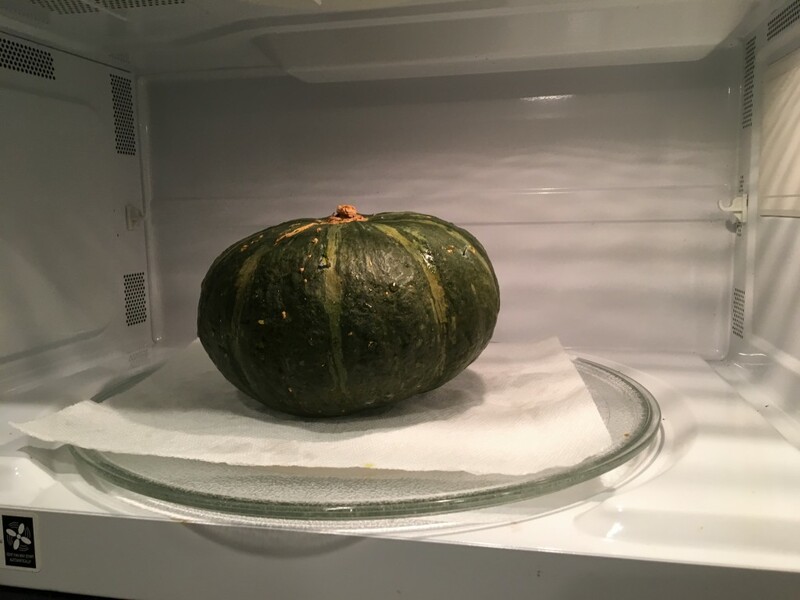 When the squash is cool enough to handle remove it from the microwave oven and place in on a cutting board. Cut it in half as far around as you can. At the end where the stem is you will just have to use your hands to pry it apart. These flexible cutting boards are my favorite. Tom bought them for me a year or so ago. They come in two sizes are light weight and thin so they are easy to store and perfect to take when traveling. When you get your food all cut up on them you can pick them up and curve the sides in to easily transfer the chopped veggies into your pot or bowl. I will post a link to them below. 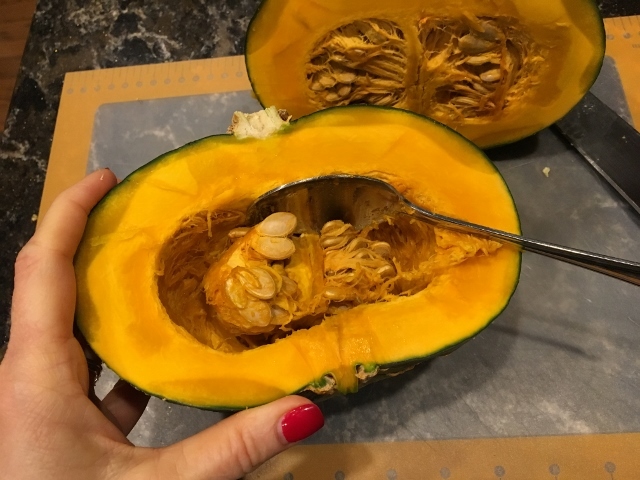 Using a soup spoon gently scrape the seeds and membranes out of the center. Some people like to wash the seeds and roasts them but I just toss them. The inside is all clean and now it’s ready to slice. After the inside is cleaned out turn the squash over and cut into wedges. Go ahead and cut the stem off if you haven’t done so already. How thick you cut the slices is up to you – 1 1/2 inches works well for me. 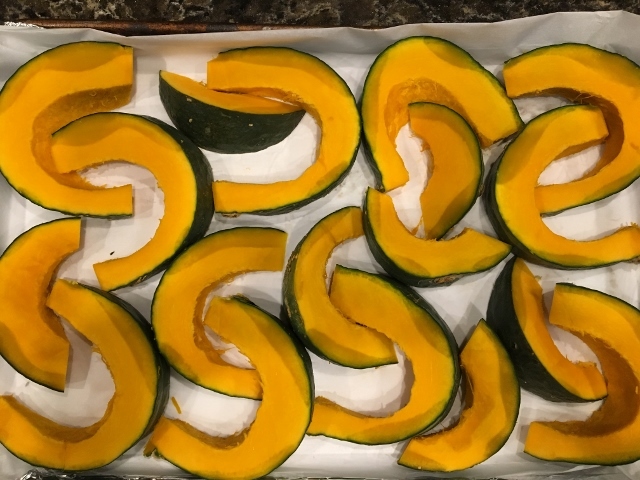 Place the prepared squash slices on a rimmed baking sheet lined with parchment paper or on a silpat mat. Preheat oven to 400 degrees. 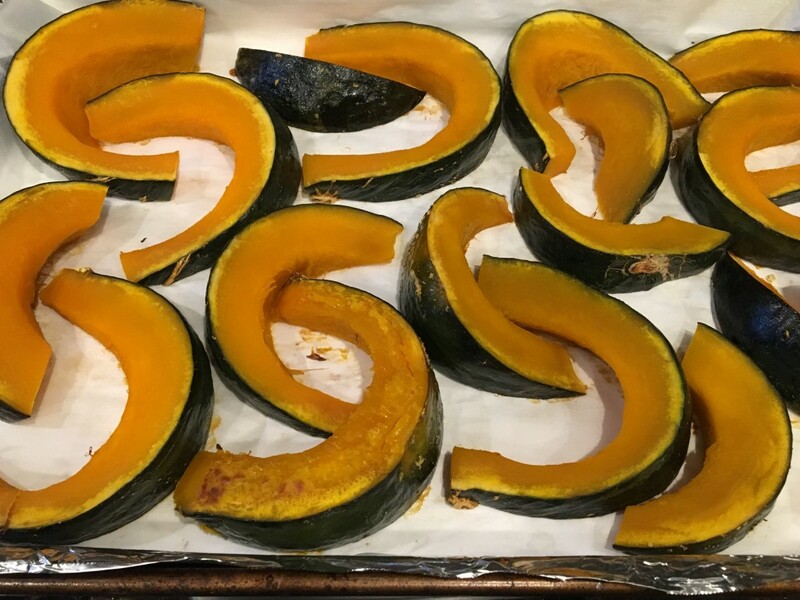 Bake squash for 35-40 minutes or until done to your preference. It will caramelize on the side that is facing down if you leave it in long enough. That does look pretty when it’s being served. You could try cooking it in the air fryer I don’t do that because I like to get it all done at once in the bigger oven. 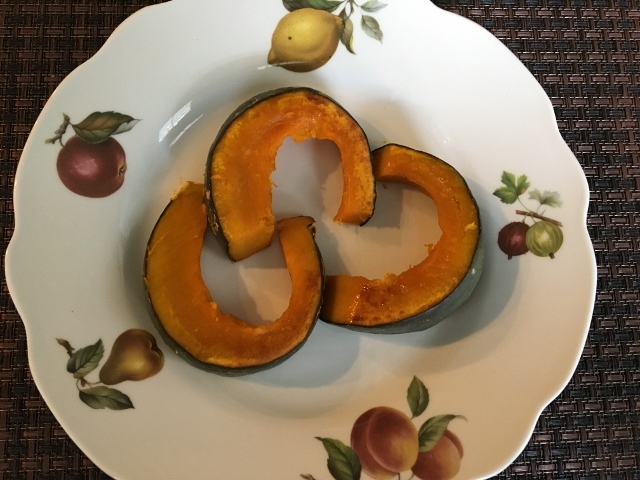 However my friend Colleen told me that she likes to reheat her kabocha squash in the air fryer – I bet that is delicious! I flipped the piece towards the center of the photo over so you could see how it was starting to caramelize. The Kabocha squash is a creamy sweet treat that lends itself to so many applications. Cut up the precooked slices and toss in a big beautiful salad. Serve it as side dish along side some BBQ Lentil Muffins. One of my all time favorite ways to enjoy it is over the top of a bowl of chili. The contrast of flavors is fabulous. If you have a favorite butternut squash soup recipe trying subbing kabocha squash – its such a nice flavor – I think you will love it! Net week is Thanksgiving! Even though we know it’s coming why is it that it always seems to sneak up on us? I will be hosting at my house this year and we should have around 13 people here. It’s going to be a blend of vegan food and non vegan food to accommodate all of the people in attendance. Luckily so many of the traditional Thanksgiving dishes are easy to make vegan and healthy. Think about it, sweet potatoes, mashed potatoes – try my Instant Pot Garlic Mashed Potatoes, mushroom gravy, green beans, beautiful salads, Brussels Sprouts, mushrooms, chestnuts, cranberries, pumpkin and apples. Add a lentil loaf and you have a lovely whole food plant based meal. It is one of the easiest holidays to veganize and everyone loves the vegan versions. My daughter Katy and I will be making all vegan dishes to serve for everyone. I am looking forward to cooking with her – we have a good time in the kitchen together. We pretty much cook the same – I think she is a far better cook and I learn all kinds of tips from her. Hubby Tom will be watching our little Sweat Pea (granddaughter) so we can concentrate on the food prep. We will start on Wednesday and get a head start on things. That will make Thursday a little easier. We usually eat around 1:00. That way if the weather is nice it allows us time to go out for a walk in the afternoon and get some fresh air. The back up plan in cases the weather isn’t nice will be to play games and keep everyone engaged in activities! Wishing you all a Healthy Happy Thanksgiving Day! I am linking to some of my favorite kitchen items here. I use the Chef’s Knife every day for everything. Its one of the best kitchen tools I have. Tom keeps it nice and sharp for me. The flexible cutting boards are amazing. I have them in both sizes and they are in constant use. The silpat mats work well and come in different sizes. We are working on an Amazon favorites page where I can share all of my tried and true favorite kitchen tools and the books I love. Stay tuned for that. The Amazon Associate links help to support the blog without any extra cost for you if you use my links to purchase these products. Thank you for your support. What time of day do you have your Thanksgiving meal? Great post. Bookmarked for future reference. Thanks much! Tami,I can usually pin your articles to my pinterest site but was unable to do with this one. No pin symbol came up..Am I delusional? I found it..Ignore my last comment..I am suffering from prepping and cooking overload!! Great post, Tami, and thanks for the mention! I love my winter squash, and leftovers are even more delicious in the air fryer. Really enjoying our Breville! I am so glad you like your Breville Colleen! We love it too!